Traditional wooden rounders set, can be enjoyed by adults and children alike. 4 x Wooden Stumps � 60cm x 2.5cm diameter / 1 x Blaze Wooden bat / 1x Soft Round Wooden Bat / 2 x Baseball Ball / 2 x Red Rubber Mats / 1 x Printed Instruction Paper. 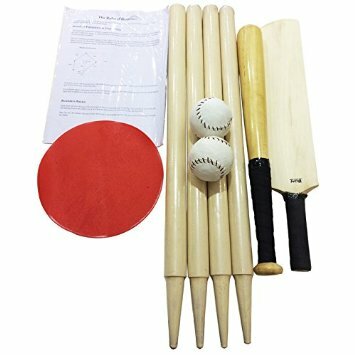 Our standard Rounders set comes with everything necessary to play this classic English game; A wooden Rounders bat, A rounders Ball, 4 wooden Rounders Posts as well as two mats to mark the positions of the bowler and current batter.